In August of 2008, I received a phone call that my cousin had passed away at age 59. Fatty food and beer make a deadly mix. Jim was a single Californian, with many friends, an insatiable appetite for life, and a Ford man since he could talk! He was also a hoarder of the first order - too many items to mention, and no relatives to help (I live in Maryland). There were 25 cars in his fleet from 1946 to 1998. A few ran, many were junk, but there were also a few classics including a 1958 Edsel convertible, a 1966 Lincoln convertible with suicide doors, and two Mustangs - all sitting in a field behind his house, some covered, others not. For Mustang lovers, a true jackpot was in Jim's yard. A 1970 Mustang Boss 429 in grabber blue and a plain white 1968 Mustang 428 fastback. I would soon find out what a 135 CJ car was (VIN 8F02R135045). Jim purchased the Boss brand new from the Russ Davis dealership in Southern California when he was kid. 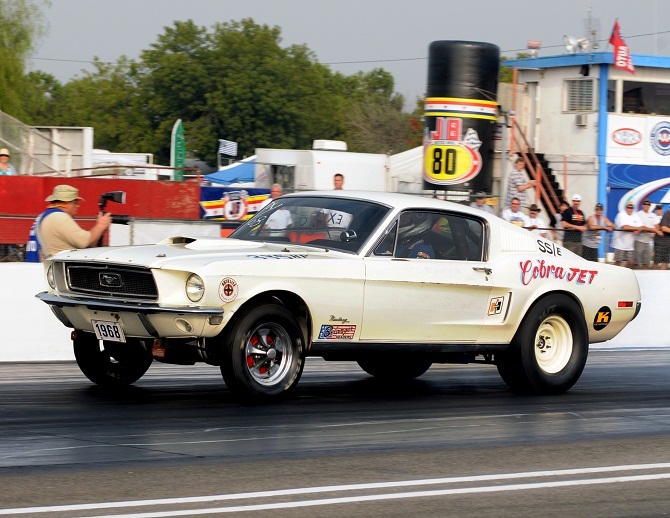 I have no idea where he purchased the 1968 Mustang, but since he was a frequent visitor to the several drag strips around Southern California, I can only surmise that he was close enough to the action to recognize a car of value that was in need of saving. As of now, the 1970 Boss (VIN # 0F02Z144338) is in storage. It runs, all matching numbers, well-kept with a black interior, some surface rust on the under-body, and no dents. The car is a survivor with one owner, but is in need of a good home and restoration. As for the 135 car, it too is a survivor with limited under-body rust, no substantive dings and dents, great interior, original Wimbledon White paint with large red Cobra Jet letters on the side. Alas, a race had apparently shattered the engine block and two pistons and they were missing. All the other engine and transmission parts were there. The car has 150 miles on it, and has a 3.25 standard axle ratio, a four-speed wide ratio transmission, a Hurst shifter, roll bar, and Keystone headers. The only body work that was done on the car was on the hood where there are four locking pins. Discussions with several restoration experts on the 68 are underway. A decision is pending.